Habit: Grows in dry and rocky habitats or poor soils and is shade intolerant. Carolinea fastuosa Moc. & Sessé ex DC. Pachira fastuosa (Moc. & Sessé ex DC.) Decne. Pseudobombax ellipticum cv. alba hort. 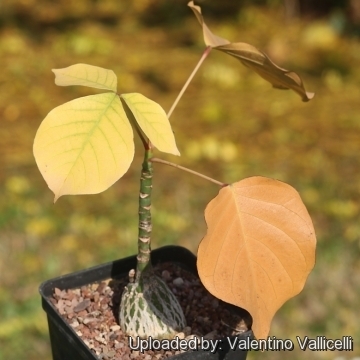 Description: Pseudobombax ellipticum, best known as Bombax ellipticum, is a fabulously attractive fast-growing deciduous tree with a smooth green caudiciform trunk that can reach 18(-20) m in height. Coveted for it's unique brush-like flowers in late winter, the leaves are an attraction as well. This is a fine shade tree as well as a show stopper bloomer suitable for bonsai treatment as well. 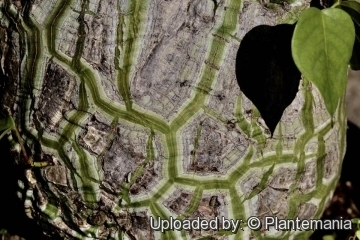 Trunk: Smooth, green marbled with gray, semi-succulent up to 1.3 m in diameter often bulging and specialized for water storage. Its branches are close to the base and the new twigs are bright green. 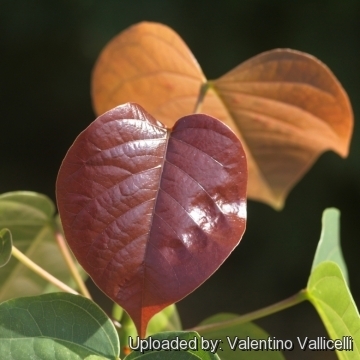 Leaves: Long-stalked, alternate, palmately compound and articulated, with 3-6 (mostly 5) oval leaflets 10-22 cm long. New leaves are a quite attractive deep maroon colour and turn a fine green as they get older. Flowers: Single or aggregate inflorescences (short cymes), 15-20 cm across, clustered at ends of branches before leaves; petals long and liner, pubescent on the outside, white to purple that separate and curl back to frame a cluster with hundreds of bright silky pink purple stamens topped with yellow pollen. The stamens are usually shorter than the petals, but up to up to 15 cm long, forming a tube in 2 concentric rings with only the bases fused (like a comb). The stamens are loosely clustered in 5 groups in each ring. There is also a white flowered form (forma alba). Blooming season: Winter to early spring. (December-March). The flowers open at night and fall off some time in the day and only last for the one day. Fruit: Elongated, dehiscent capsules 15-25 cm long, by 2.5-3.5 cm in diameter, yellow-brown, glabrous, containing numerous seeds. The fruit contain a fluffy fiber around the seeds and rippens in January-February in his native regions. Seeds: The seeds are wind dispersed. Pseudobombax ellipticum (Kunth) Dugand: (var. ellipticum) Deciduous tree with a smooth green caudiciform trunk with showy purple brush-like flowers in late winter. Petals, widespread, 9-16 cm long by 1-2 cm wide. Pseudobombax ellipticum var. tenuiflorum A.Robyns: has smaller petals, about 6,6-8 cm long by 0,9-1,3 cm wide. Distibution: Endemic to the Mexican state of Veracruz. Pseudobombax ellipticum cv. alba hort. : White flowering form. 1) Wikipedia contributors. "Pseudobombax ellipticum." Wikipedia, The Free Encyclopedia. Wikipedia, The Free Encyclopedia, 20 Mar. 2013. Web. 31 Aug. 2015. 2)Armando Dugand. "Revalidacion de Bombax Ceiba L. como especie típica del genero Bombax L. y descripcion de Pseudobombax gen. nov." Caldasia, vol. 2 nr. 6, blz. 67 1943. 5) Los Angeles Arboretum Members' Magazine, December 2006 February 2007 <http://biodiversitylibrary.org/page/43556217> Web. 31 Aug. 2015. 6) Martínez Salas, E. M., M. Sousa Sánchez & C. H. Ramos Álvarez. "Región de Calakmul, Campeche. Listados Floríst." México 22: 1–55. 2001. 7) McVaugh, R. "Ochnaceae to Loasaceae." 3: 9–751. In R. McVaugh (ed.) Fl. Novo-Galiciana. The University of Michigan, Ann Arbor. 2001. 8) Pérez J., L. A., M. Sousa Sánchez, A. M. Hanan-Alipi, F. Chiang Cabrera & P. Tenorio L. "Vegetación terrestre". 65–110. In Biodivers. Tabasco. CONABIO-UNAM, México. 2005. 7) Reyes-García, A. & M. Sousa Sánchez. "Depresión central de Chiapas. La selva baja caducifolia." Listados Floríst. México 17: 1–41.1997. 8) Sousa Sánchez, M. & E. F. Cabrera Cano. "Flora de Quintana Roo." Listados Floríst. México 2: 1–100. 1983. 9) Stevens, W. D., C. Ulloa Ulloa, A. Pool & O. M. Montiel Jarquín. "Flora de Nicaragua." Monogr. Syst. Bot. Missouri Bot. Gard. 85: i–xlii, 2001. 10) Balick, M. J., M. H. Nee & D.E. Atha. 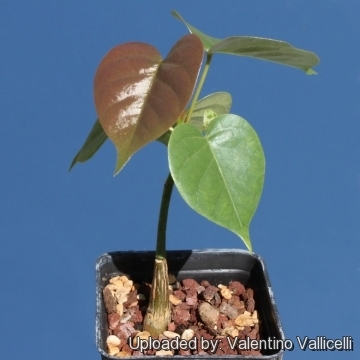 "Checklist of the vascular plants of Belize." Mem. New York Bot. Gard. 85: i–ix, 1–246. 2000. 11) Berendsohn, W.G., A. K. Gruber & J. A. Monterrosa Salomón. "Nova Silva Cuscatlanica. Árboles nativos e introducidos de El Salvador." Parte 1: Angiospermae - Familias A a L. Englera 29(1): 1–438. 2009. 12) Breedlove, D.E. "Flora de Chiapas. Listados Floríst." México 4: i–v, 1–246. 1986. 13) CONABIO. 2009. "Catálogo taxonómico de especies de México." 1. In Capital Nat. México. CONABIO, Mexico City. 14) Linares, J. L. "Listado comentado de los árboles nativos y cultivados en la república de El Salvador." Ceiba 44(2): 105–268. 2003 . 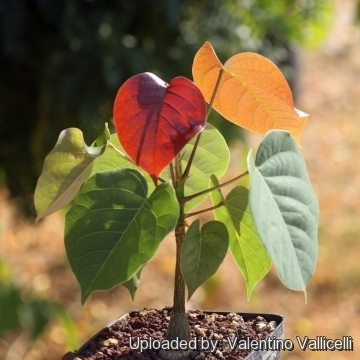 Cultivation and Propagation: This magnificent flowering tree is an excellent growers and extremely easy to take care. 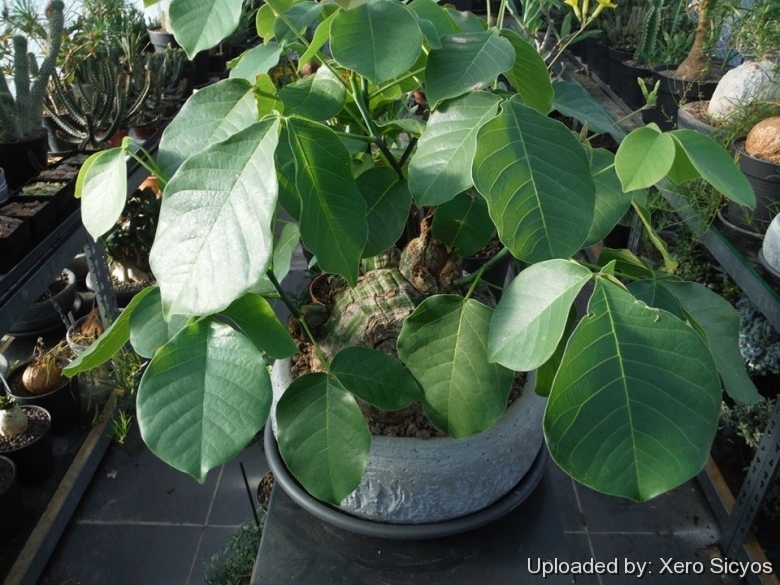 If planted in a tropical area with good soil and given plenty of water it can get really big but it can also make a great houseplants. If kept potted and trimmed the tree can be kept around 1 m in height. 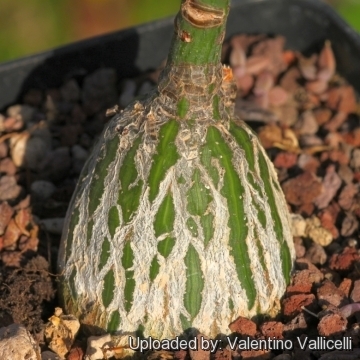 A caudex will form (fat base) sometimes resembling a turtle shell. Psedobombax are grown in full to partial sun. Watering: It like plenty of water. Never let it dry out completely or you'll have a dead plant. Then again, don't over water either or you'll have a rotten one. It is a deciduous tree and will loose its leaves in the winter. It should be kept a little dry at this time. In the spring, summer and early autumn you should increase the water. 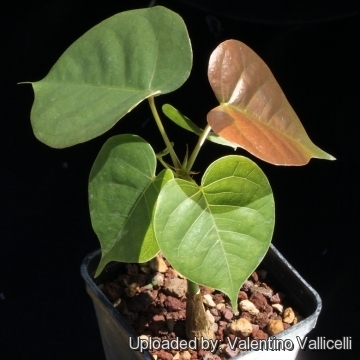 Hardines: It is a tender tropical specie that should survive minimum temperatures down to -7° C for short periods of time (especially if dry) but it is best to protect it when the temperatures fall bellow 0° C. If you live in frost prone areas than you have to grow it in pots. Its very sensitive to hot summer sun while kept as a potted plant. Pruning: After the flowers are gone, the leaves will sprout and if it is needed you can trim the tree. 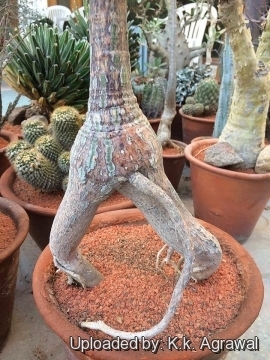 This plant like to grow as a tree and don't need any pruning, but you may cut every year the branches so the trunk base (caudex) would get larger. Propagation: It is propagated by seeds and cuttings. Seeds are apable of germinating under partial shade but will eventually die without direct sunlight. The cuttings, 40 -100 cm in length and 2-5 cm in diameter, are easily rooted when planted in bags of sand and watered daily or when planted directly in the field.